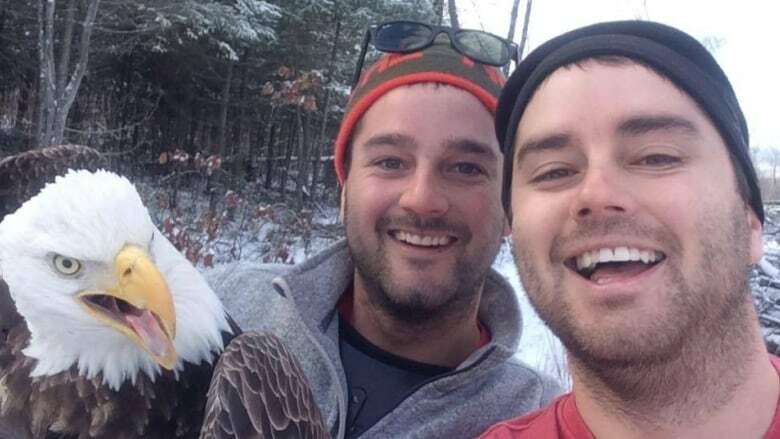 It's not every day that you get to take a picture with a bald eagle, but two brothers in Sudbury did just that after rescuing the bird from a hunting trap. Now, their efforts are being applauded by a local bird expert. It's not every day that you get to take a picture with a bald eagle, but two brothers in Sudbury did just that after rescuing the bird from a hunting trap. On Tuesday, Neil Fletcher's brother Michael posted a picture on Facebook of the pair grinning in a selfie with the unmistakable white-headed bird — "Canada's largest bird of prey", according to Canadian Geographic. Neil Fletcher told CBC News he and his brother were out hunting when they noticed several ravens circling nearby. As the pair got closer, they discovered a bald eagle with its foot stuck in a hunting trap. "It was relieving to see that it was still alive," Fletcher said. "I knew we had to do something right away." The two brothers slowly approached the large bird, draping a sweater over its head to keep it calm. "At first the eagle was a bit nervous to have my brother and myself there," Fletcher said. "As soon as he realized we were trying to help he kind of calmed down a little bit. His head would kind of move back and forth to look at us, but that was the most he'd do," he said. Fletcher said it took some time to get the bird free. 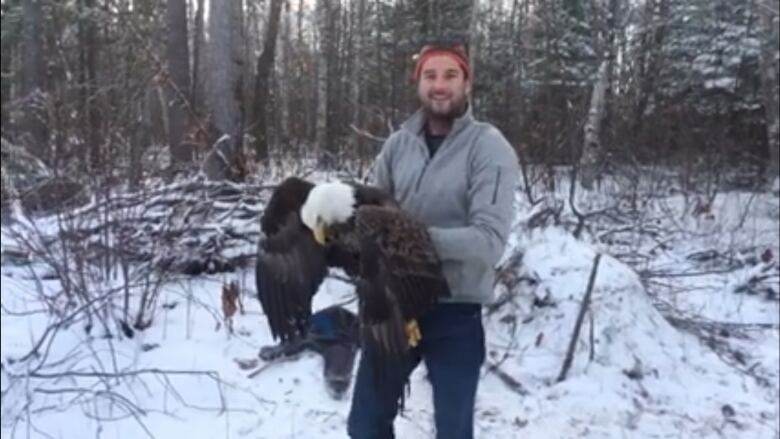 "The eagle was actually holding on to [the trap] and we were having a hard time getting him to let go," he said. Once the eagle's foot was out of the trap, Neil suggested they take a selfie with it. "I knew this would never happen again, so before we let it go, I told my brother Michael, 'we should take a picture with it.' The bird had its mouth open, but he never tried to fly or bite or do anything," he said. "It made it pretty easy [for us to] take a picture with it." Now, their efforts are being applauded by a local bird expert. Chris Blomme, with the Sudbury Ornithological Society, said freeing the powerful animal took some guts. "I think it's really great the Michael and Neil took the gumption to actually try and deal with the bird, because it's quite a large, predatory bird with sharp claws and a sharp beak," he said. "Most people might be a bit hesitant to approach them. However, covering them up over the head is a good way to blind the bird so you can approach it." Blomme said it's not unusual these days to spot a bald eagle in Sudbury. "I've had people report bald eagles soaring right over downtown," he said. "They've become a little bit more common because of the prohibition on DDT, so the population has become a little more healthy in Manitoulin and Sudbury." As for Neil Fletcher, he said the experience is one he and his brother will never forget. "Me and my brother, we've always been in the bush, always been hunters. And we've always had a lot of respect for bald eagles," he said. "We were just really amazed— and still are."